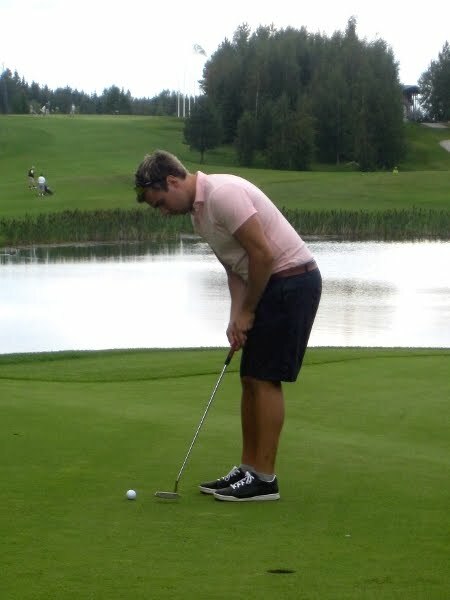 Universitas Golf, an unofficial Finnish championships in academic golf, was organized on Monday, 6th of August, 2012. 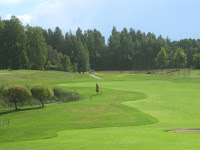 The event was organized at Golf Pirkkala in a weather that was ranging from beautiful sunshine to forceful rain showers. The course was in a good condition. The competition was a best ball team event. Two teams from Aalto University were participating. 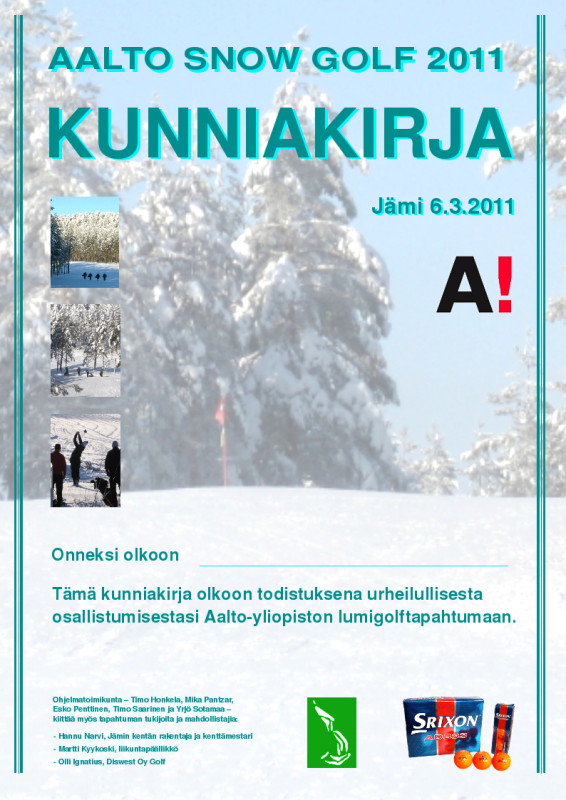 After the teams of University of Tampere (Mikko Ahonen and Hilkka Kankaanpää) and University of Jyväskylä (Pekka Lumela and Väinö Varstala), the team of Aalto, Joona Kalliokoski and Timo Honkela reached the third position. 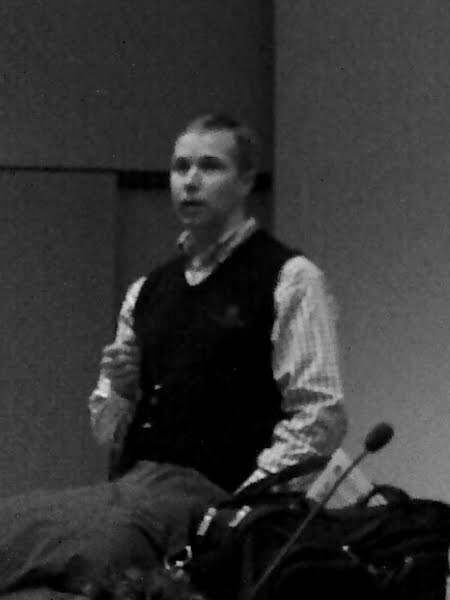 Also the other Aalto team, Timo Saarinen and Esko Penttinen, reached a top ten position. 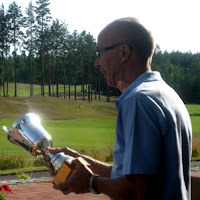 More detailed results are available at http://www.uta.fi/jarjestot/utagolf/ and http://www.nexgolf.fi/gpi/tournaments.nxg?r=689&bb=true. 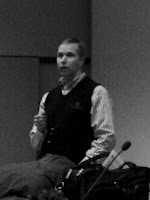 The 8th Aalto University School of Business Invitational competition was played in Vierumäki on 15th of August, 2012. The arena was the Cooke course. The weather was great. 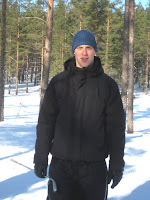 The day was even one of the warmest of the otherwise quite chilly and rainy summer of 2012 in Finland. 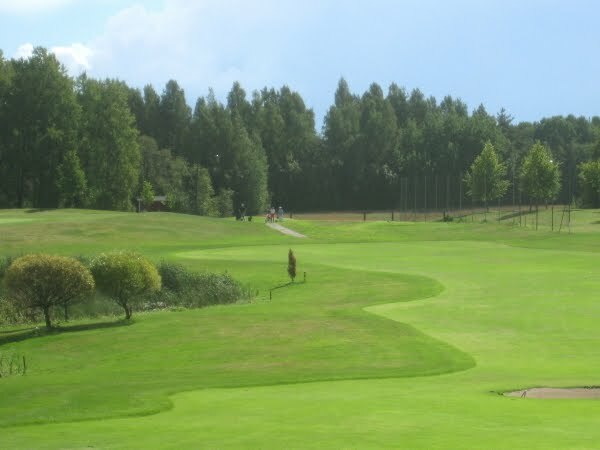 The course hosts two holes among the 18 best holes in Finland selected by GolfDigest in 2011. The fairways were in good condition but this year the greens were not. The closest to the pin competition was played in hole 8 where the opening shot needs to reach over a beautiful water area. The longest drive competition took place in hole 6. Twenty players participated the event, three of them women. They represented different departments of the School of Business or various collaborators. 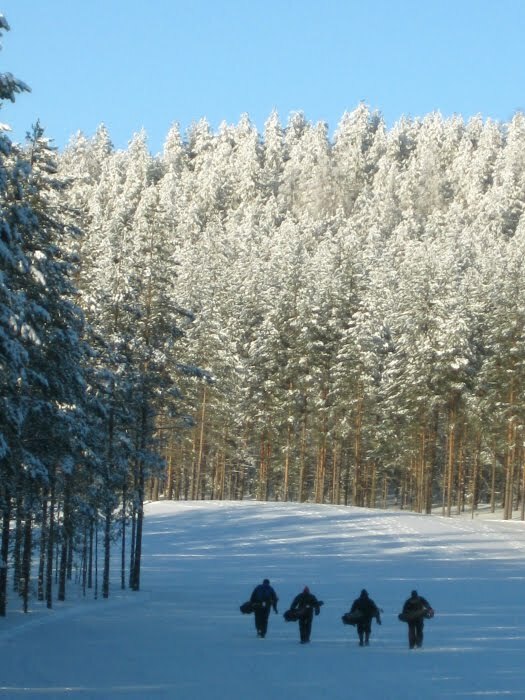 The twenty were from 14 different golf clubs in Finland. 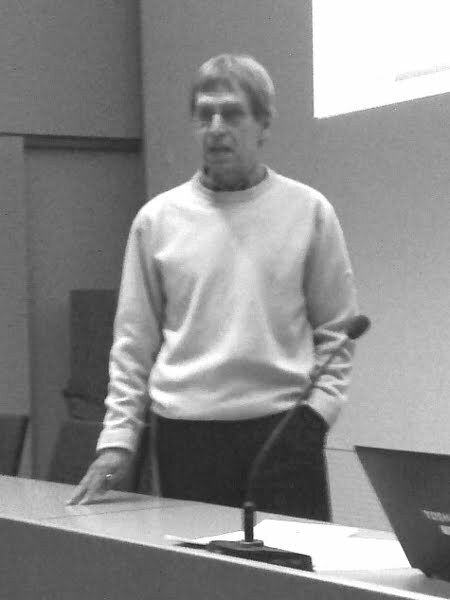 As the organizer of the event, Martti Kyykoski told about the history of the competition and its previous winners. 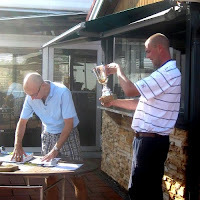 This year the winner was Juuso Leivonen who had the lowest score, 75 shots, and who also got the highest number of points in the Stableford competition, 36. With his low handicap, he reached the first position over the two competitors, Jukka-Petri Lehtonen and Thomas Lindholm, who also got the same result of 36 bp. 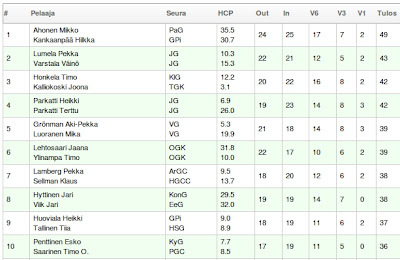 The winner of women's competition, Mari Syväoja, got the same result, too. 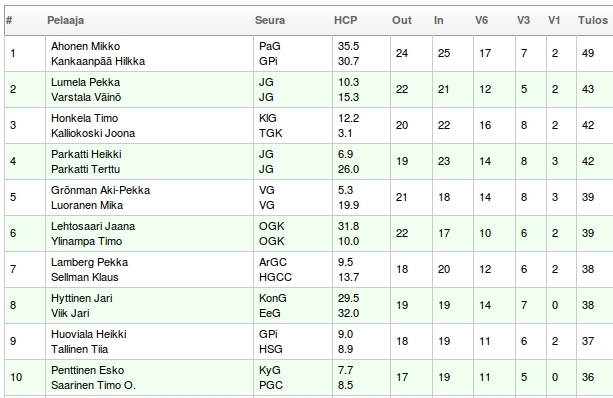 The next players with lowest number of shots after Leivonen were Esko Penttinen and Mika Suikki, both 83. In the women's competition, Bettina Mandelin reached the result 80. Mandelin also won the longest drive competition (about 225 meters). 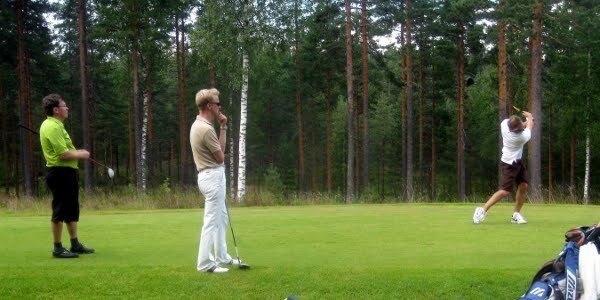 Markku Salimäki took the first position in the closest to the pin competition. 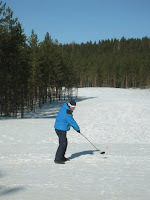 The first Aalto University Snow Golf competition took place on Sunday, 6th of March, 2011. 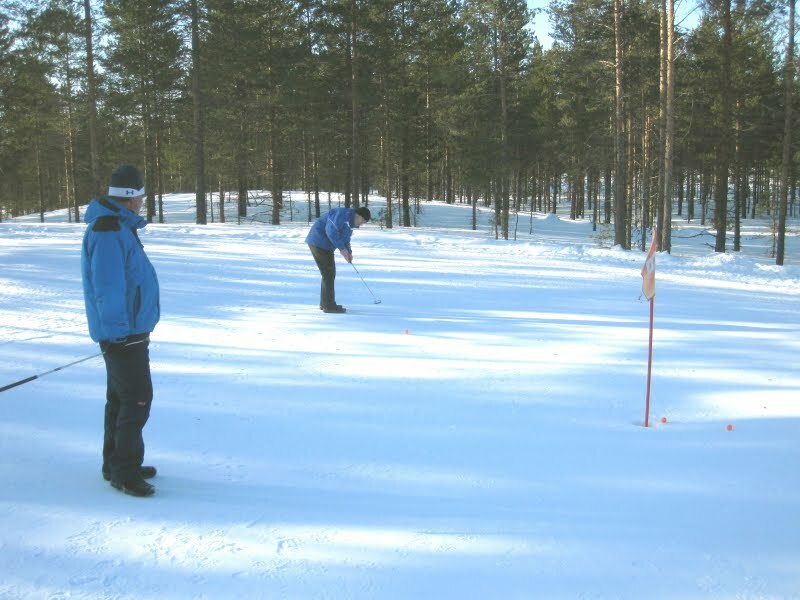 The staff challenged students into a competition at the Jämi snow golf course in Jämijärvi. The weather was sunny which enhanced the beautiful views at this unusual golf arena. Many of the participants were for the first time at a snow golf course but regardless of that the summerly skills were in good use. On the left, Kari Tikkanen shows his skills in a opening shot at the hole 3. 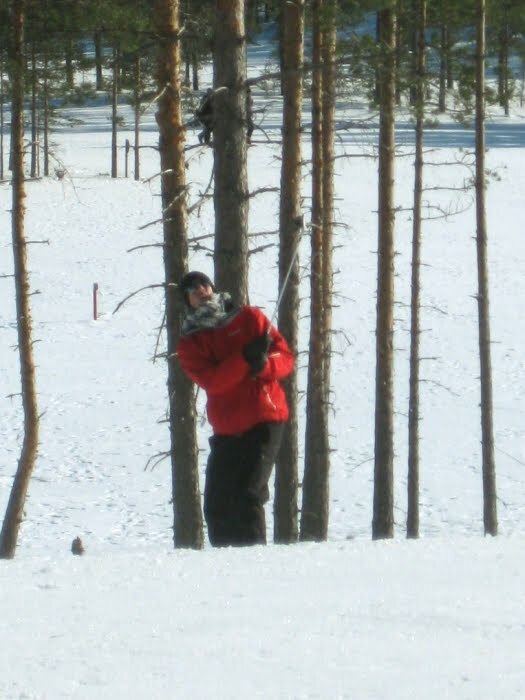 On the right, Timo Saarinen gives an example of a successful drive at the hole 8, a 475 meters long challenge. 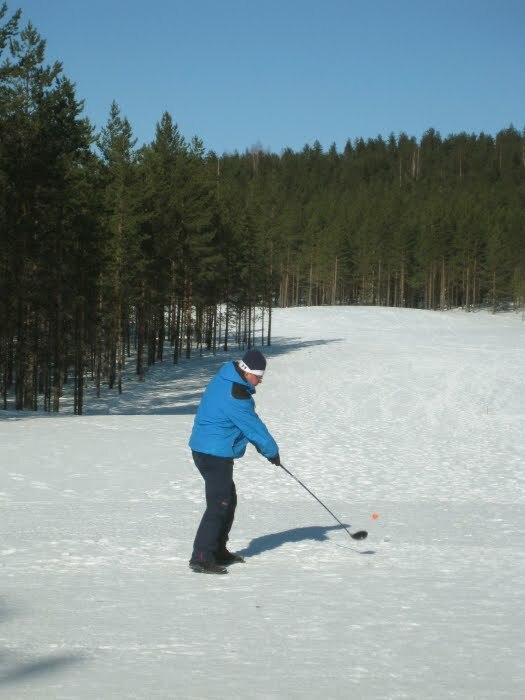 The whites in a snow golf course were in a good shape, thanks to the efforts of the course constructor Hannu Narvi. The holes are to some extent larger than their summerly counterparts and the flag is kept at its place all the time. The speed of the whites was slower than usually due to the snow and temperature conditions. The near game was essential in achieving good results. 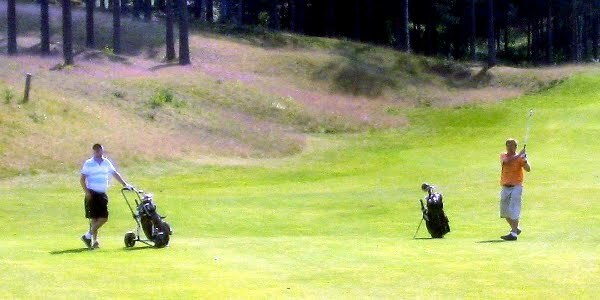 On the left Heikki Laitasalmi approaches successfully the 7th hole, after a struggle through the 480 meters long fairway. On the right, Alexander Doepel shows that a golfer with only one year's experience can enjoy this kind of sports. 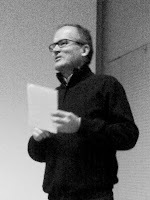 In the end, the results of the competition were considered less important than the time spent together and the chance to enjoy a novel experience. Among the students, the best result was achieved by Joachim Björnström (on the right) who collected 33 bp. 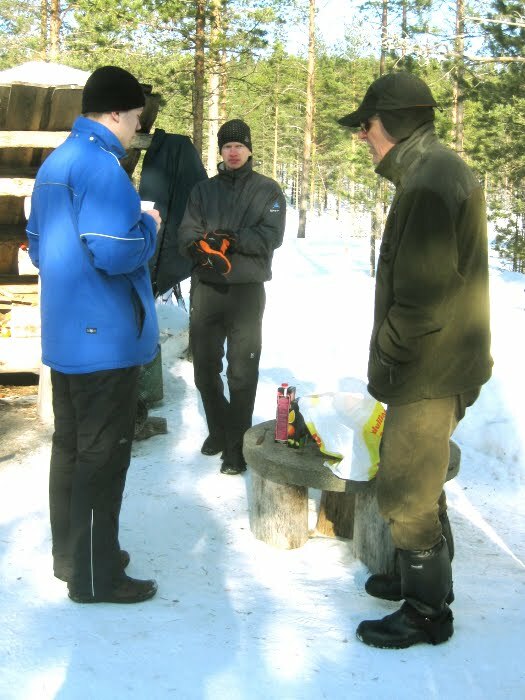 One point more was gained by the best among the staff, Esko Penttinen who stands in the middle on the left side photo. Penttinen, Laitasalmi (on the left) and Narvi (on the right) discuss while waiting for the sausages to be ready. 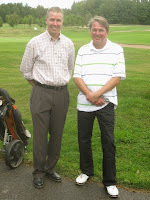 The staff won the competition by reaching a slightly better average in the bogey points. 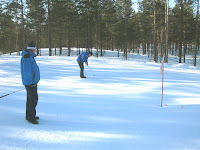 The staff had a slight advantage as Timo Saarinen and Timo Honkela had earlier experience of the Jämi course. 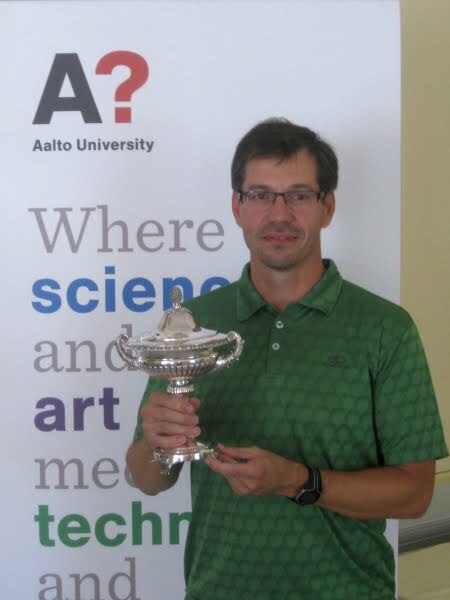 The competition was supported by Martti Kyykoski (Physical Recreation Director, Aalto University School of Economics) and Diswest Golf that provided the orange Srixon AD333 balls. 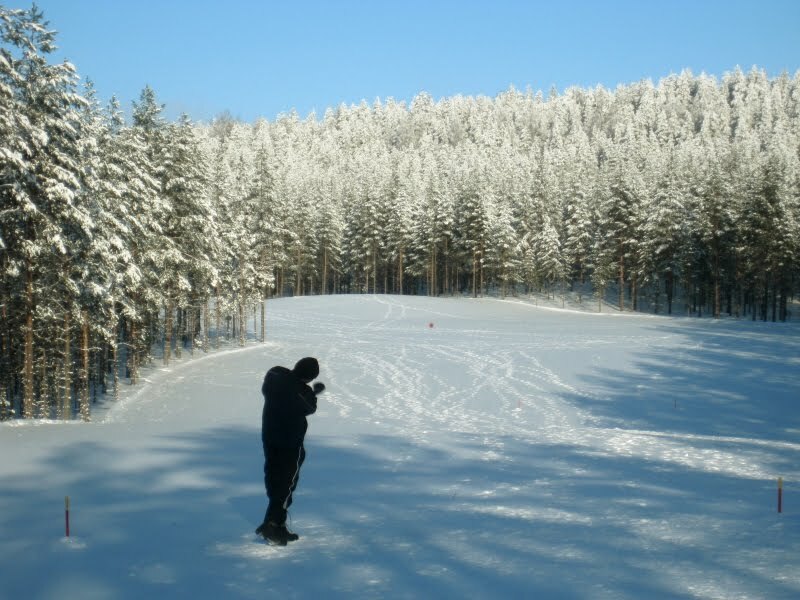 The organizers, Timo Honkela, Mika Pantzar, Esko Penttinen, Timo Saarinen and Yrjö Sotamaa acknowledge Hannu Narvi's efforts - without his enduring commitment to the snow golf course such an event would have not been possible. 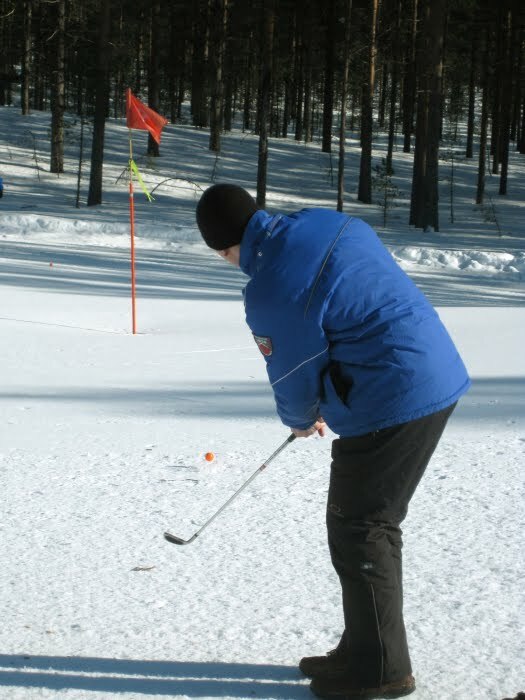 In spite of the winterly conditions, the course provides all challenges that one can expect, except for water hazards and bunkers. 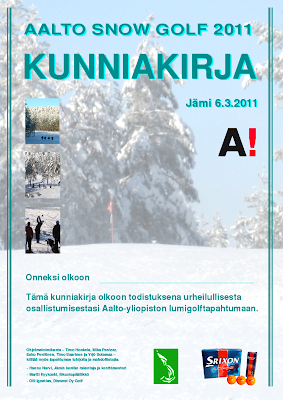 The staff of Aalto University challenges the students into a snow golf competition on 6th of March, 2011. More information will be available soon. Golf innovations were discussed and promoted in a seminar organized at Aalto University in the middle of Finnish winter on Wednesday, 15th of December 2010. The event took place in the spirit of the EIT ICT Labs that will develop and deliver, for instance, excellence and entrepreneurship in education, novel ICT services, and an European open innovation ecosystem for ICT and its applications. The event brought together a number of speakers and participants representing both research and business. The event was chaired by Dr. Timo Honkela who gave an opening talk titled "Golf as a source of wellbeing, as a research object and as a business area". In his presentation, Honkela described among other things a study by Karolinska Institututet in which it had been found that practicing golf prolongs life in the average by five years. In addition to what the original researchers report, he presented some hypotheses related to the mental side of golf: Golf has some aspects that remind meditation, it is a positive addiction that keeps golfers on the move, and it provides continuous learning challenges as well as many experiences at the social level. Kari Helin and Niko Helin from Innotiimi Ltd described in detail how the understanding and awareness of one's thinking style can support learning. Their company Innotiimi is famous for applying Jung's and Myers-Briggs' theory on thinking styles in business contexts and Kari Helin has authored influential books in this area in Finland. 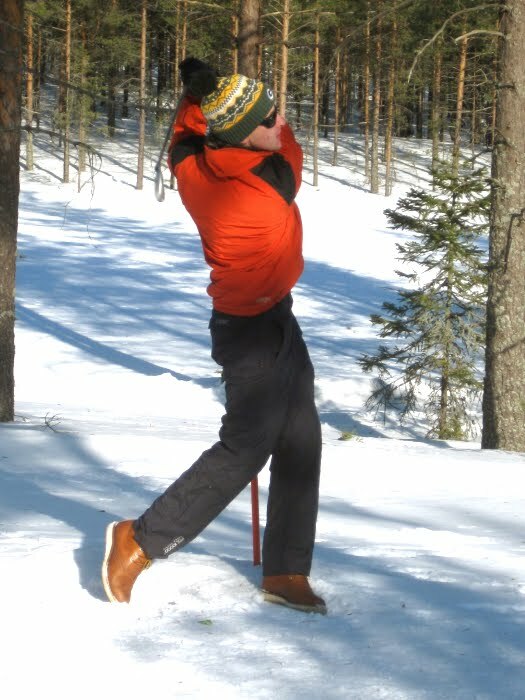 Based on his practitioner's interests, Kari Helin has earlier applied the methodology in orienteering and now they also have created an application for golf. They gave detailed examples on how different golfers have different tendencies that should be taken into account in training and playing. 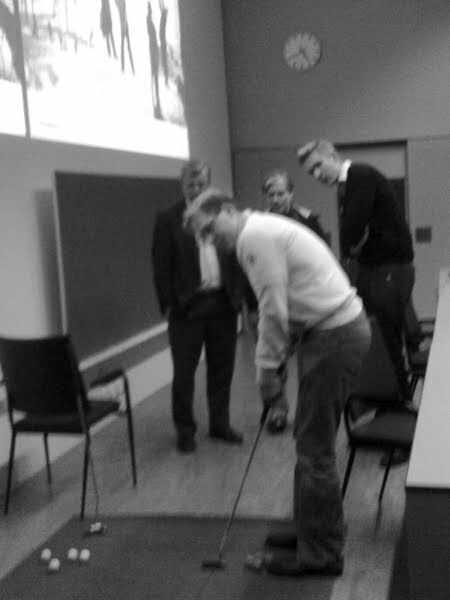 Seppo Karikko and Tapio Santala presented the latest developments around 4dswing, a golf swing analyzer that has been even characterized to be the best in the world. The system is based on machine vision research. 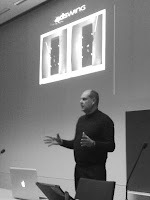 Karikko described the steps the system has taken in the Swedish markets and Santala gave some examples of its use. The system is useful for golfers who wish to fine tune their game with the help of dedicated coaches using the latest technology. 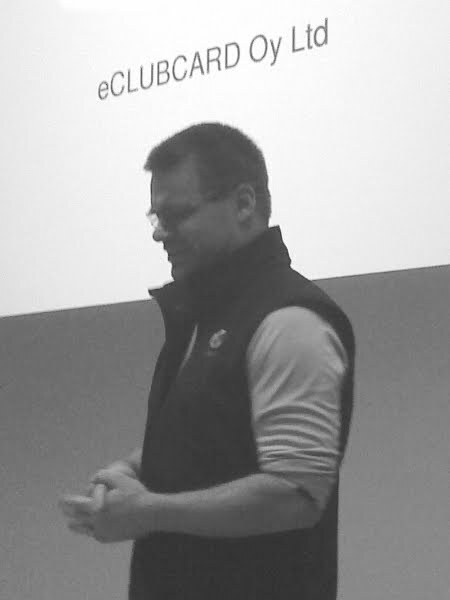 Pekka Niva from eisGOLF described innovations related to the extended use of a golf club card. 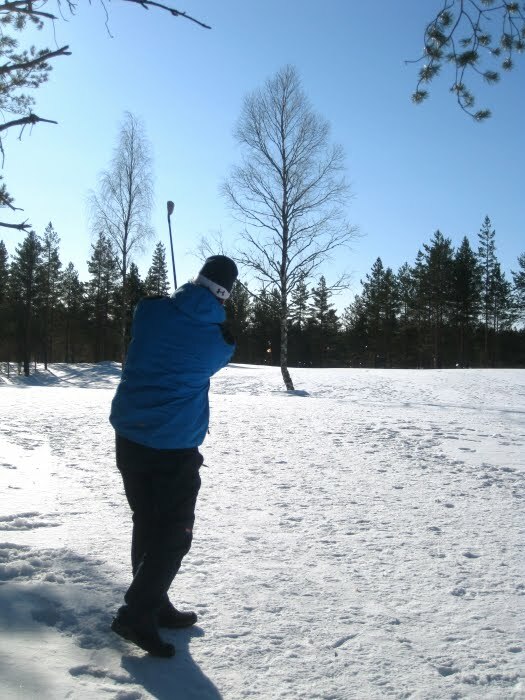 In Finland, the information infrastructures are typically modern, and Niva explained how additional benefits can be gained by integrating different systems to provide seamless services for the users provided by the golf clubs. The main focus was in the activities that support successful golfing experience, e.g. related to registration process and customer benefits for regular golfers. The provision of such services requires that a large proportion of relevant stakeholders are included. engineering, design, and social systems intersection and integration challenges addressed by the industry and the research community. The core of the SDE program is research-to-operation oriented courses that integrate the learning outcomes of the other courses in the curriculum. 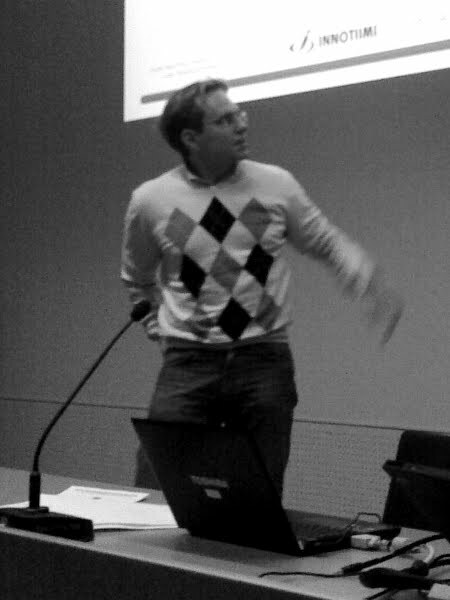 Mikko Manerus ja Elias Pietilä from Free Drop Innovations Inc. presented the GameBook concept that is an intuitive real-time event scoring system. 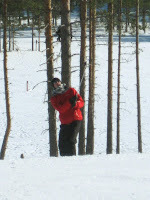 GameBook is globally perhaps the best known Finnish golf innovation. In particular, the focus has been in the US markets where the company has gained considerable success. One of the ingredients for the success has been the fact that Free Drop Innovations has built a team that includes winners of British Open (Stuart Cink), European Tour events (Mikko Ilonen), NHL Stanley Cup (Teemu Selänne) and Apple Design Awards (Elias Pietilä). The event was generally considered successful by the participants who had a chance to discuss details of the existing products and services and to build basis for new innovations, for example, through finding new potential collaborators. 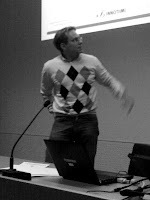 The seminar ended informally by a small competition in a sports invention by Timo Honkela called golfling or gorfling. 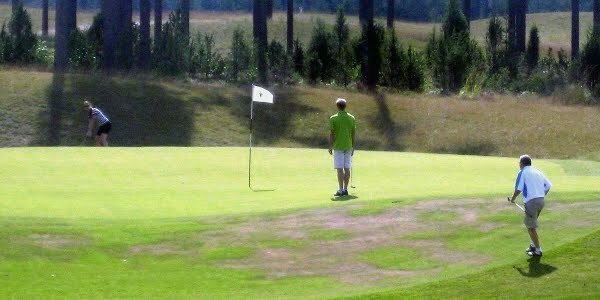 This sports is an amalgam of golf putting and curling. The 1st Aalto Golf Trophy was organized on Monday, 23rd of August, 2010, at Master Golf's Forest golf course in Espoo. 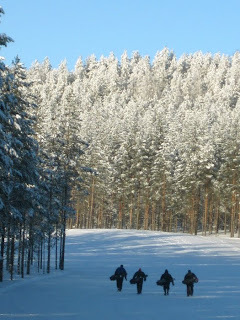 Forest is a picturesque woodland course. The weather was fine, with an exception of a short rain shower. 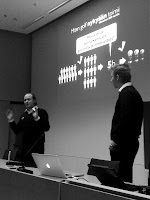 The participants were from the three schools of Aalto University and included also some guests. 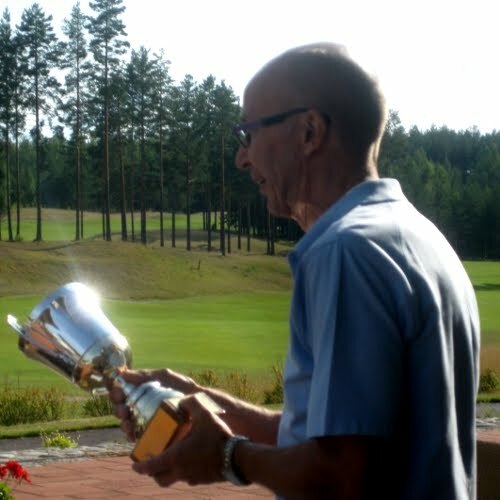 The winner of both main competitions was Keijo Hämäläinen who scored 42 bogey points with the result +6 (78). 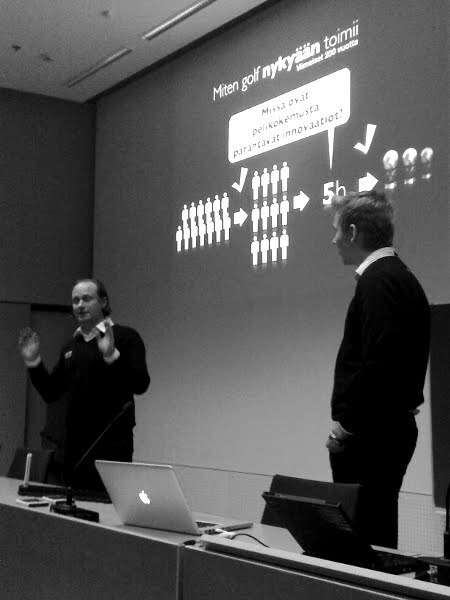 The event was organized by Mika Helenius (on the left) and Antti Ylä-Jääski (on the right). The competition was considered a success and it will be continued. The first round of the Aalto Matchplay championships 2010 has been played with the results shown below. In group B, the match was very close so that three players, Timo Saarinen, Mika Helenius and Timo Honkela each had two wins and the result was determined by the sum of the winning marginals in each match. Timo Saarinen and Mika Helenius ended up to a tie and Mika won the extra hole with a fine sand shot that landed one inch from the hole.